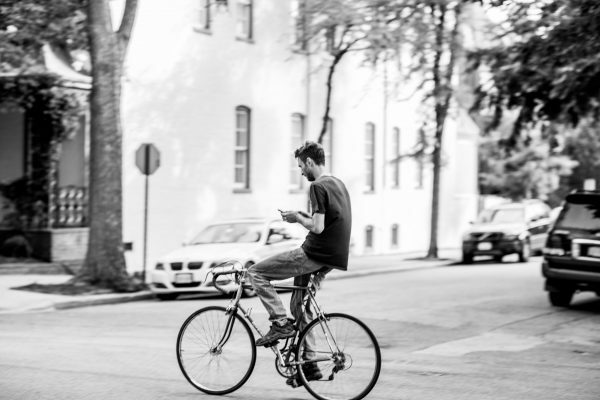 Here’s a bike safety question: Are more cyclists texting or checking their smart phones while riding? I can’t provide empirical evidence to say the answer is definitively yes or no. But observationally, I can say with certainty that I have been seeing a steadily growing number of riders who are absorbed by their phones while in motion, including the guy who almost drove into my (parked) car not long ago. Be honest: you have, too. It seems to me that this habit – yet another chapter in the larger societal narrative about chronic mobile/digital distraction – may soon produce some kind of crisis or turning point: either a cyclist fatality, or an accident involving a vehicle or a pedestrian precipitated by someone who’s paying attention to their phone instead of the road. Indeed, the imminent opening of the Bloor Street bike lanes, plus the promised acceleration of the city’s cycling infrastructure, will lead to increased bike traffic and, therefore, more instances of distracted cycling. Rather, I’d argue that there’s a strong case to be made for a robust public conversation, including public service announcements by bike advocacy groups, about the hazards associated with cycling and texting, as well as further research into the question of what precisely is the nature of the risk. Given the recent Ryerson University study showing the extremely high incidence of cycling incidents involving streetcar tracks – the infrastructure, the researchers found, is implicated in about a third of all accidents – the case for less distraction is surely compelling, even allowing for the expansion of bike lanes. According to a State Farm Canada poll released last month, over a third of cyclist respondents said they had texted while riding – “admitted” is the word used in the news report. There are plenty of humorous videos online showing cyclists working their phones while riding. There are smart phone holders that can be attached to the handlebars to make it easier to check the screen and navigate at the same time, (I recognize they’re essential for the serious gear-heads riding the country roads). In terms of sheer momentum and speed, there’s obviously no equivalence between distracted cycling and distracted driving — a problem that has deservedly garnered a lot of public and political attention in recent years. But what happens when someone is riding in mixed traffic or in a bike lane and is also checking their phone or tapping out messages? Pedestrian advocates like my Spacing colleague Dylan Reid have argued that distracted walking has been overblown as a public safety issue. Indeed, the annual level of collisions leading to injury or death due to pedestrian distraction has remained fairly constant in Ontario for almost twenty years, according to Global News. But this public service video made in The Netherlands cites evidence gathered in that country suggesting an elevated risk of accidents among those who ride and use their phones at the same time. Indeed, according to a May, 2016, Associated Press report, the Dutch government is now considering a ban on smartphone use by cyclists. Dutch authorities quoted in the story say that about smart phones “played a role” in about a fifth of young cyclists involved in accidents. Are bans the solution? Absolutely not. But I would say that municipal officials and cycling advocacy organizations should be moving quickly to develop public safety campaigns geared at urging cyclists to keep their phones in their pockets while they’re riding. From what I can find, most cycling safety guides, such as this one from Vancouver or this Government of Ontario document, have nothing to say about distracted cycling. The City of Toronto’s cycling safety page is also silent on this topic. The point is that the urban cycling environment remains fraught with all the familiar risks. In those conditions, distracted cycling is the equivalent of a self-inflicted injury. So as smart phones become increasingly difficult to sheath, we should be talking openly about this topic instead of ignoring it. After all, the anti-cycling crowd will notice those texting cyclists sooner or later, and then the debate is going to be about bans and punishments instead of safety and education. 1. The study was recently published, but the data are from 2008-8. Geographically, this picks up a lot of “streetcar territory”, but not all of the city. There are big problems with cycling safety all over the city, and just because there are no tracks on most of the roads does not mean that cyclists are any safer. The larger issue is the aggressive attitude of motorists and the lack of protected space for cyclists. One could also argue that there is an issue with aggressive cycling from the point of view of pedestrians, and distracted cycling is only going to make this worse. But at least pedestrians don’t die every day from bicycles. Correction: As you can see from the quoted text, that should be “2008-2009”. Aren’t bicyclists governed by pretty much the same “rules of the road” that apply to cars? Car drivers break the law using their phones while driving. Don’t bicyclists, too? If not, why not? Also you mention texting but not talking on the phone….? Surely under the HTA, a bicycle is a vehicle. Using a non-handsfree device whilst operating a vehicle is distracted driving. So the same penalties should apply. Also, you have a good chance of winning a Darwin award! A more minor but related issue – more of an annoyance than a real danger – is cyclists who decide to check their phone when stopped at a red light. They are never ready when the light turns, forcing other waiting cyclists to go around them (and possibly closer to vehicular traffic) when the light turns green. +1 to the argument that it’s a HTA violation, so it’s already illegal. Only problem is people are already doing SO many stupid things on the road (drivers and many cyclists alike), there’s no way the police even try to keep up. On the odd occasion I have urgent communications to share, I’ll pull over – and it’s damned easy with a bike anyway. It’s an unacceptably stupid thing to ride and text.